One of my favorite books of the last few years was The Creed of Violence, by the elusive and mysterious author, Boston Teran. Set mostly in pre-revolutionary Mexico in the early Twentieth Century, it featured two great protagonists and an engrossing, convoluted and thought-provoking story. 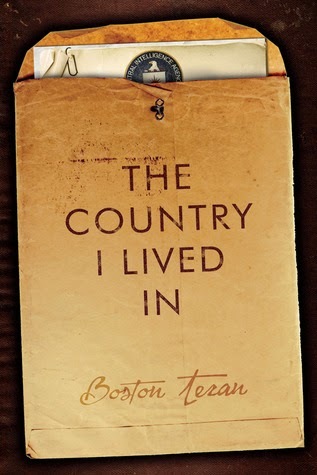 Now comes an excellent sequel, The Country I Lived In, set in Texas and in Mexico, and featuring John Rawbone Lourdes, the son and grandson of the two protagonists from the earlier book. It's the dawn of a new age in the United States; prosperity reigns, rock and roll has come crashing into the culture; the early glimmerings of a new civil rights movement can be seen in the South and elsewhere, and the Beats are beginning to pave the way for the Counter Culture revolution that would transform the country only a few years later. Against that backdrop, though, powerful forces are resistant to change, fearful of a Communist menace from abroad and afraid that those who challenge the status quo here at home are weakening the country from within. Barry Goldwater has not yet suggested that extremism in the face of defense of liberty is no vice, but there are those who clearly believe this to be the case. And they are ready and willing to take whatever steps they feel are necessary to protect what they perceive to be America's best interests, whether it involves overthrowing governments abroad or stamping out internal dissent here at home. Into this mix steps John Rawbone Lourdes, a young man made old before his time by having fought in both World War II and Korea. Now he just wants the opportunity to finally get to know the country that he has given so much to defend. "Something was missing from his life, something of purpose and destiny, to take away the quiet sadness that kept to itself inside him." Lourdes has bought a new Packard convertible and wants nothing more than to "hit out on the road...[like] Huck on the river, Parkman on the Oregon Trail, Brando burning up miles of asphalt in The Wild Ones." Fate intervenes, though, when Lourdes gets a desperate call from an old army friend in Laredo who is in trouble and needs his help. Sadly, Lourdes arrives only a little too late, to find that his friend has been tortured and murdered. Lourdes feels honor-bound to investigate and avenge his friend's death, even though he has no idea what sort of trouble his friend might have been in. It soon becomes apparent that some very dark and mysterious forces are at work here, including agents of the CIA. They immediately put the squeeze on Lourdes, suggesting that he was in league with his murdered friend in illegal activities and questioning his own patriotism in spite of his long and decorated military service. But in the spirit of his father and grandfather, John Rawbone Lourdes is not a man to be intimidated or to be distracted from his self-appointed mission. He is also not a man who should be underestimated. What follows is a scary and fascinating tale that races deep into the heart of Mexico and involves a great cast of characters, including two very gutsy and determined women. Like its predecessor, this is a book that will keep most readers up well into the night and that will keep them thinking about these characters and about the issues this book raises for a very long time to come.